Skybound Games released today a new trailer for the upcoming last episode of TELLTALE’S THE WALKING DEAD: THE FINAL SEASON, titled TAKE US BACK. This highly anticipated ending will officially launch digitally on PC in the Epic Games Store, as well as on Nintendo Switch™, PlayStation®4 and Xbox One, on Tuesday, March 26. Physical boxed editions of THE FINAL SEASON (containing all four episodes) will also arrive for consoles on March 26 and are available to pre-order now at major retailers. January 15, 2019 (Los Angeles, Calif.) – The third episode of TELLTALE’S THE WALKING DEAD: THE FINAL SEASON, titled "BROKEN TOYS," is now available for purchase on PC in the Epic Games store, as well as for Nintendo Switch™, PlayStation®4, and Xbox One. Visit Skybound.com for more details, and view the latest trailer for "BROKEN TOYS" here. The concluding fourth episode of TELLTALE’S THE WALKING DEAD: THE FINAL SEASON releases on March 26, 2019. Fans interested should stay tuned via Skybound Games’ Twitter, Instagram, and YouTube, as well as www.skybound.com. The Walking Dead: The Final Season's third episode is now available, and it's actually the reason we now know the release date of the fourth episode. 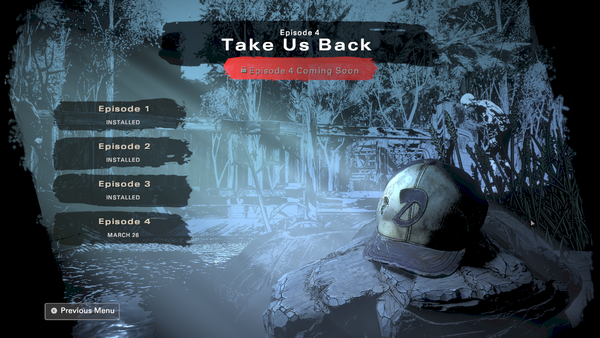 The in-game menu for The Walking Dead: The Final Season has been updated, and as you can see above, it states Ep. 4 is set for release on March 26th, 2019. I don't think you can get anymore official than that! While there was a short time where we all thought the series to be dead, those days have come and gone. We now know that The Walking Dead: The Final Season - Ep. 3 is set to release on Switch Jan. 15th, 2019. Above you can see the debut trailer for the episode. Skybound has just put out an update on their continuation of Telltale's The Walking Dead: The Final Season. 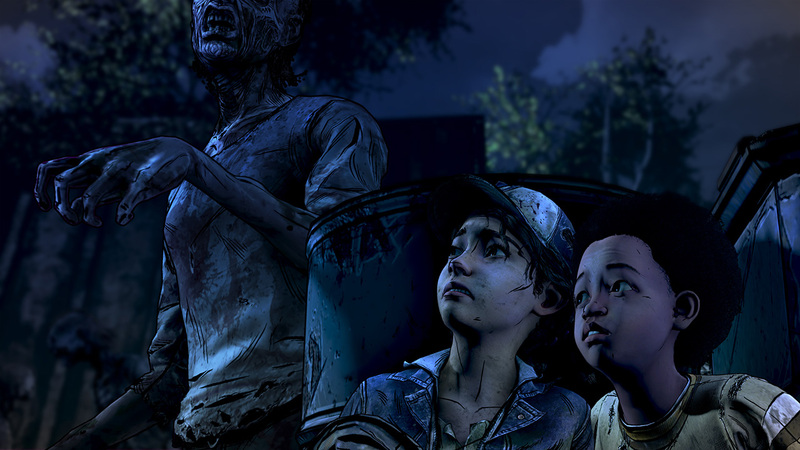 Work on the series is indeed moving ahead, and multiple Telltale devs are involved. Check out the full statement below. 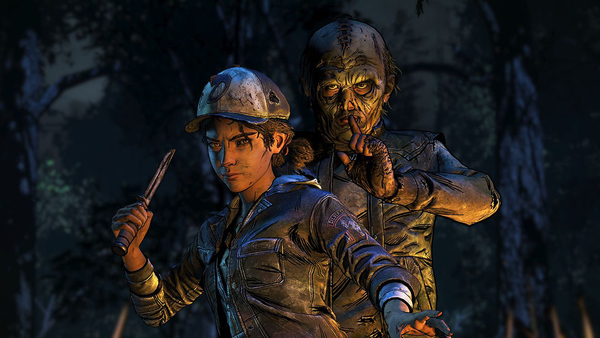 Skybound Games’ CEO Ian Howe dropped in over at Reddit today for an AMA that focused on the company's work to wrap up The Walking Dead: The Final Season. The one question that kept coming up concerned the release the date Ep. 3 for The Final Season. Here's the answer Howe shared during the AMA. Of course, Howe had a ton more to share about The Final Season in general. Here's some tidbits that were discussed. The situation surrounding Skybound Games' plan to finish up The Walking Dead: The Final Season after Telltale's closure has caused all kinds of confusion. It looks like Skybound is setting out to solve some of that. The dev team will be hosting a Reddit AMA this Wednesday at 2 PM PST in order to field questions and clear the air. I know I have a question or two I'd love to have answered! Looks like we have our answer about the future of The Walking Dead: The Final Season, and it's good news for fans. Walking Dead creator and Skybound founder Robert Kirkman confirmed the news at NY Comic-Con, and also said that he plans to bring on the original Telltale devs to help wrap the series up. Thanks to Elfman13 and Andreslop24 for the heads up! Telltale said weeks ago that a skeleton crew would be staying with the company to keep things going, as far as their prior obligations were concerned. Narrative designer Rachel Noel was part of that team, but according to a tweet she sent out today, that whole team has been laid off as well. No rhyme or reason for the layoffs were given. UPDATE - Rachel Noel has updated her statement to say that just her team was laid off, but there are still people at the company. Thanks to PhantomLiger for the heads up!